Non Profit organisations play an important role in the delivery of programs and services. 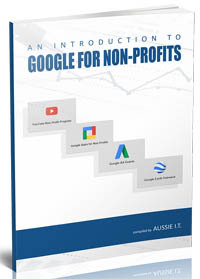 Google for Non-Profits offers qualifying non-profit organisations a suite of products and tools that can help you reach new donors and volunteers, work more efficiently, and tell your non-profit’s story. As a member of Google for Non-Profits, you'll have access to premium Google products that are free for organisations like yours. YouTube Non-Profit Program: Premium branding capabilities on YouTube channels, and increased uploading capacity. Google Apps for Non-Profit: Free version of the Google Apps business productivity suite, including Gmail, Docs, Calendar and more. Google Earth Outreach Grants: Free licensing for Google Earth Pro. Have a registered account with Connecting Up, the regional arm of TechSoup Global. Acknowledge and agree to the application's required certification regarding non-discrimination and donation receipt of use. Note: Google reserves the right to grant or deny an organisation's application or participation at any time, for any reason, and to supplement or amend these eligibility guidelines at any time. Selections are made at Google's sole discretion and are not subject to external review. Confirm that you meet the eligibility criteria above. Obtain the certification of your organization’s nonprofit status from ConnectinUp and supply relevant ID number. During which you will need to nominate just ONE website domain for your non profit organisation. This process is quite quick if you get the application right. Once you have applied for and been accepted into the overall Google for Non Profits program you will need to then apply specifically for say the Google Ad Grants service. Create your new AdWords account from the links provided to you. You SHOULD NOT be required to enter any billing or credit card details. Submit "mission based" sample ads and keywords which meet their criteria for review and approval. Your chances of approval will be enhanced if you can demonstrate an understanding of the use of Google AdWords and how it will assist your non-profit organisations mission. This process may take a few weeks. Utilise and actively manage the Adwords Campaign to maintain your eligibility.